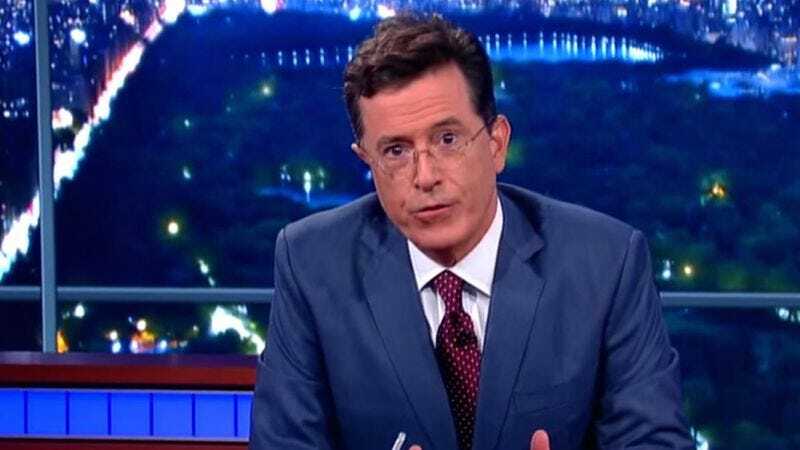 Two months into his tenure as the king of CBS late night talk, Stephen Colbert has slipped into third place in the primetime rankings, falling behind competing hosts Jimmy Fallon and Jimmy Kimmel. Fallon’s dominance isn’t really surprising; he’s got the cachet of The Tonight Show behind him, and his viral-friendly shenanigans were handily thrashing Colbert’s Late Show predecessor Dave Letterman well before Colbert stepped in to fill his shoes. The Kimmel thing is slightly more alarming for Late Show fans, though, since Colbert spent his first several weeks running well ahead of the former Man Show star. But now, with the hype around the show’s September premiere fading, the two hosts are running roughly neck and neck, trading off weeks and battling for the honor of coming in second to Jimmy Fallon’s reuniting of the cast of Roundhouse, or playing spin the bottle with Liam Neeson, or whatever pre-packaged fun the Tonight Show host is hocking this week.